Welcome, This site's main purpose is for viewing Wade Figurine pictures and my Wade Collector's Link . Please enjoy. Collecting sure has been enjoyable - actually addicting too. 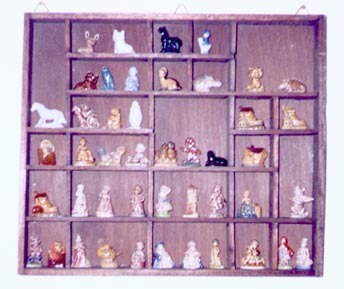 I have been collecting around 4 years now and I am always looking for those special older solid cast pieces, the Whimsies 50's, and I am now trying to complete my house collection. Please take a peek at my favorite display shelf with some oddities on the upper left, My One of A Kind Seals PA Fair Draw 2001, and my favorite The Wizard Of Oz Set. I do have some duplicate Wades for sale (mostly the smaller solid miniatures from Red Rose Tea and Tom Smith Party Crackers, which are my favorite.) I am currently trying to acquire all the new Red Rose Tea's Noah's Ark Series Set that just came to my area Store. I do sell occasionally on ebay as user ID (wadenut) . My ICQ No. is 8402369 (put Wade in first message.) I would love to chat. My name is Sherry, and I am from the Southwest coast of Florida. I have five grandchildren, a Non-Wade husband, just love to go fishing, and grow orchids. Please register to the Yahoo Groups to join the WadeWhimsies email-chat posting group (very informative). It is very informative and all are welcome. Another new forum message board that is well needed is found at KS Waders site. My favorite author, Pat Murray has a new Wade Whimsical Book out. It's great to look up those whimsies!! French Porcelain Feves are here!!! I am a new dealer. Check my site for my new additions. They are solid, minature whimsie like and under 1 1/4 inch. They have nice painted detail . I just love them. Please check my pages and see what is out there in this Wade cyber world.